Today Beaver Stadium stands as the second largest stadium in College Football. The capacity sits at 106,572. Adding in standing room, this stadium can top 110,00. 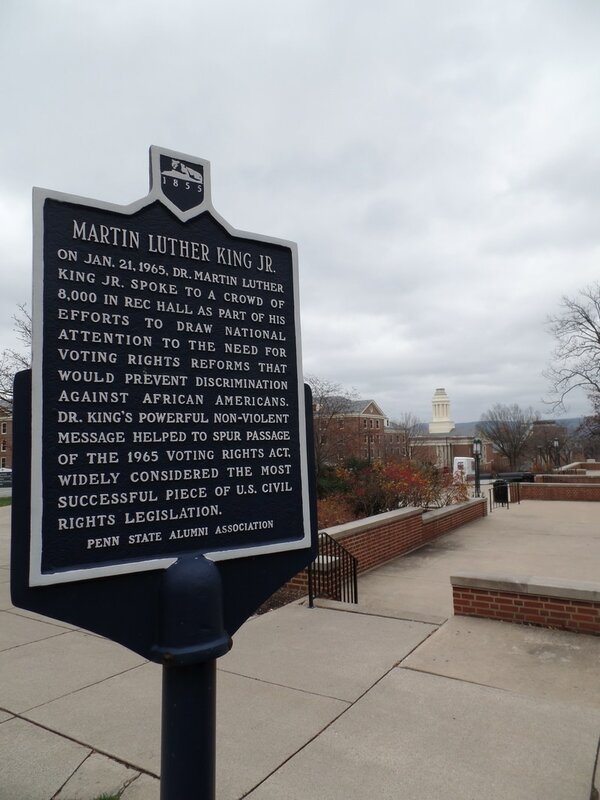 The current location ​is not the original, a space by the Rec Hall is where the original stadium was. The stadium got its name in 1960. When the new stadium opened the capacity was just over 46,000. The East side of the stadium goes up 110 rows. The majority of the seats here are bleacher style seating. A portion of the student section is here as well. Above the 110th row you will see 60 sky boxes. There are three levels of boxes. On the front of the boxes you will see the years of Penn State's Big Ten titles. 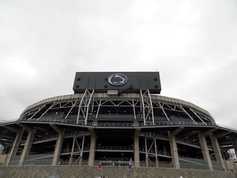 At the top you will see "The Pennsylvania State University". The upper level of the South Endzone was built in 2001. This added 11,500 seats. 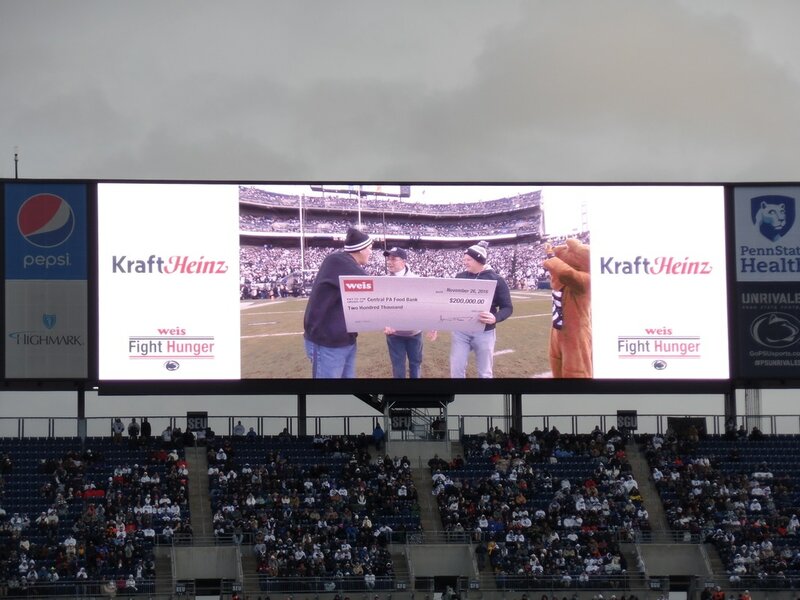 Around 4,000 of those are for the Mount Nittany Club Level. This the only part of the stadium with permanent chairback seats. The seats are navy blue. On the lower level, you will find the student section and the "S Block". The tunnel that the lions come out of is featured here as well. The West side of the stadium goes up 100 rows. The seating is like the East side. At the top of this part of the stadium is the press box. On the north side, the lower level is all bleacher seating. The upper level has some chairback seats in the lower portion of the upper deck. 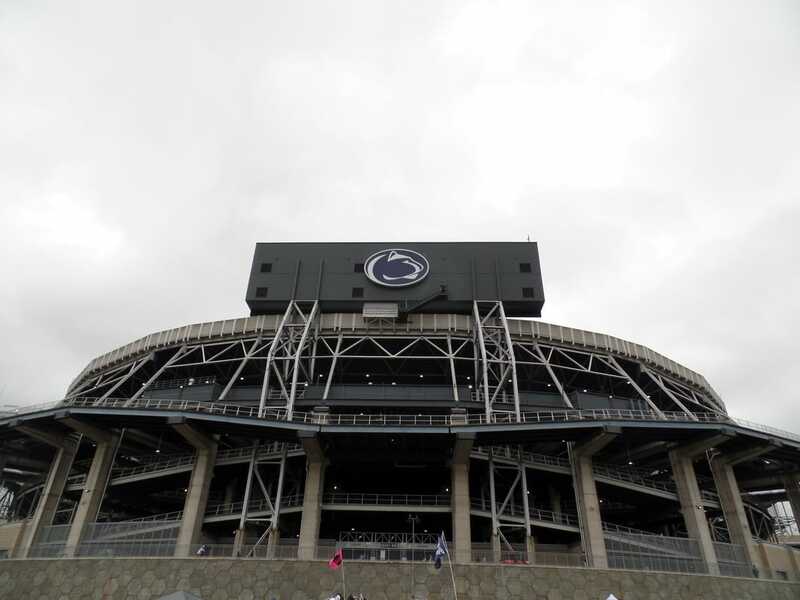 Beaver Stadium features two scoreboards in the North and South end zones. The north end zone has the largest board, 5,700 square feet. The South board is mega too at 4,600 square feet. The boards have ads on the side of them. On the backside of the scoreboards you will see the Nittany Lion logo. 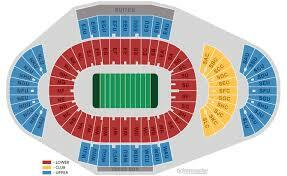 Ribbon boards are found on the front of the North End Zone upper level seating and both upper levels in the south. One place check out via the lower level concourse is the All Sports Museum. The concourse features the traditional sporting event food. 1. You will hit parking right when you get off the highway. Be prepared to pay 40 dollars. If you are able to get them in advance for $15 dollars. 2. Time to walk to campus. First stop? Berkey Creamery. No matter how cold it is expect a line for this amazing ice cream. 3. There are a few things worth taking a photo with. The "WE ARE" Sculpture, Nittany Lion Shrine, and Old Main. If you walk down Curtin Road you will find the sculpture, shrine and ice cream. Old Main is a street away on Pollock. 4. Check out the tailgating scene. It is kind of hard to miss. ​5. Head to Beaver Stadium! Beaver Stadium: I really like Beaver Stadium. Check my rating below. Overall it gets the second highest score for a college football stadium. I just want Beaver Stadium to be even better. The majority of the stadium just seems dated at this point. I visited the stadium in 2007 and it looks the same outside of upgrades to the video boards. Upgrades: Overall the stadium doesn't blend very well. The lower level and the upper level just seem off. I would make the lower level on the east and west two levels. Where they have the walkway now make that the cutoff. This should bring the stadium together bit more. Also would give fans better vantage points and bring them closer to the field. This should increase the atmosphere level as well. A new press box would have to come with the new upgrades and that would be a big plus. The current one is dated and needs to go. The outside of the stadium would get an upgrade too. No longer will you see the long poles that support the stadium. Add a new facade around the stadium. Upgrades to the concourse on both sides would be great too. 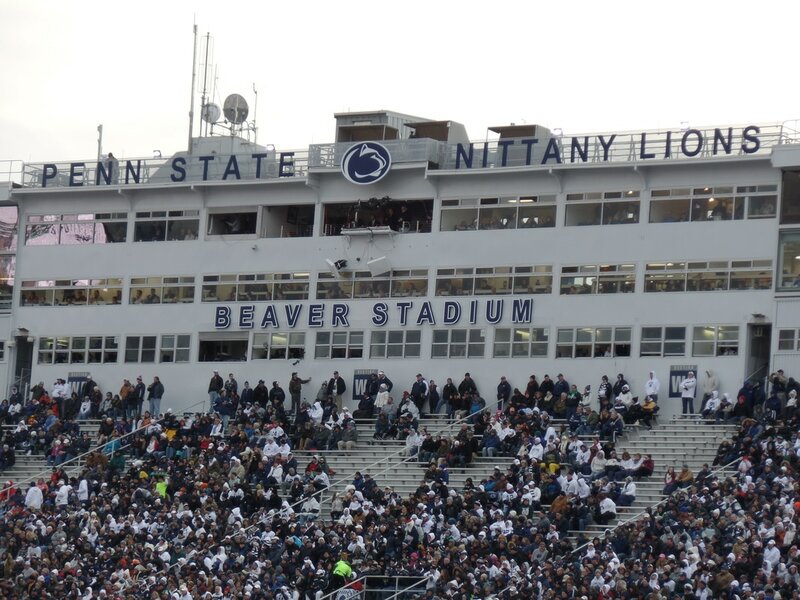 With all these renovations, it would take Beaver Stadium to a whole other level. Again, I don't hate the current setup but man, imagine what it could be. Penn State Campus: Penn State is located in the center of the state of Pennsylvania. In 1953 Penn State became an university. Today the university has over 45,000 students attending each year. The University Park location has a plenty to see on campus. 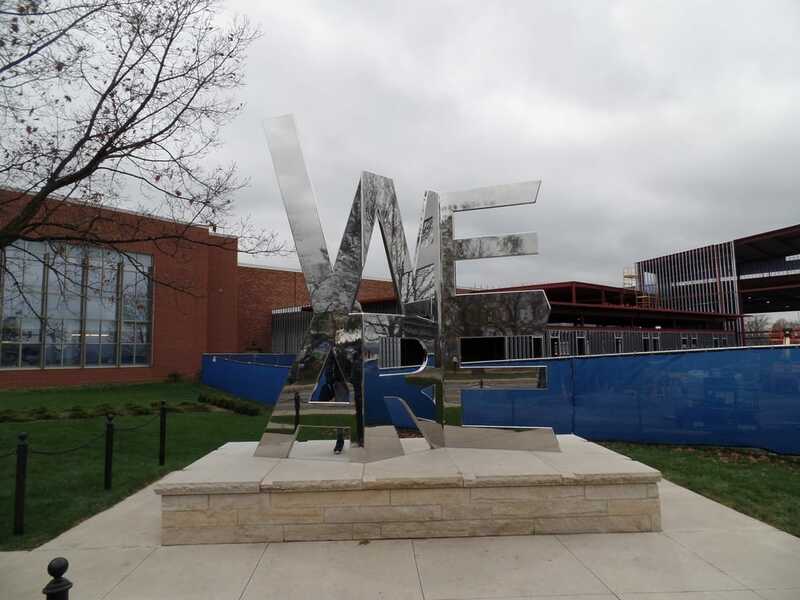 First stop and get a picture at the "We Are" statue located on the corner of University and Curtin. 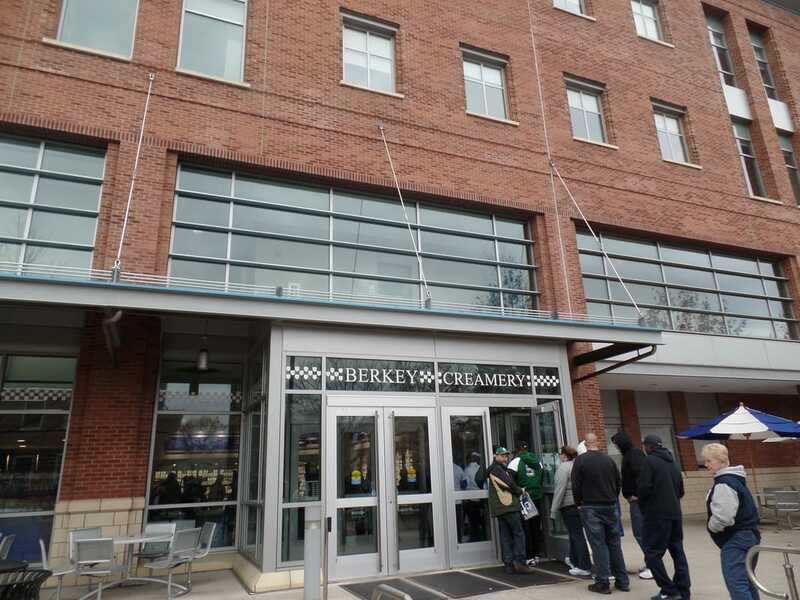 Keep walking down Curtin and you will see a line forming outside of Berkey Creamery. They have a lot of flavors, don't forget the "white out" sprinkles. Continuing down Curtin, Palmer Museum, will be on your right. The art museum is free of charge. Another good picture opportunity is here with large cat paws leading up to the entry way. The Nittany Lion Shrine is where a lot of people will be on game day. The shrine was built in 1942. It had a major upgrade in 2012. Across the way is the Rec Hall. The Hall is the former home of the Penn State basketball team. 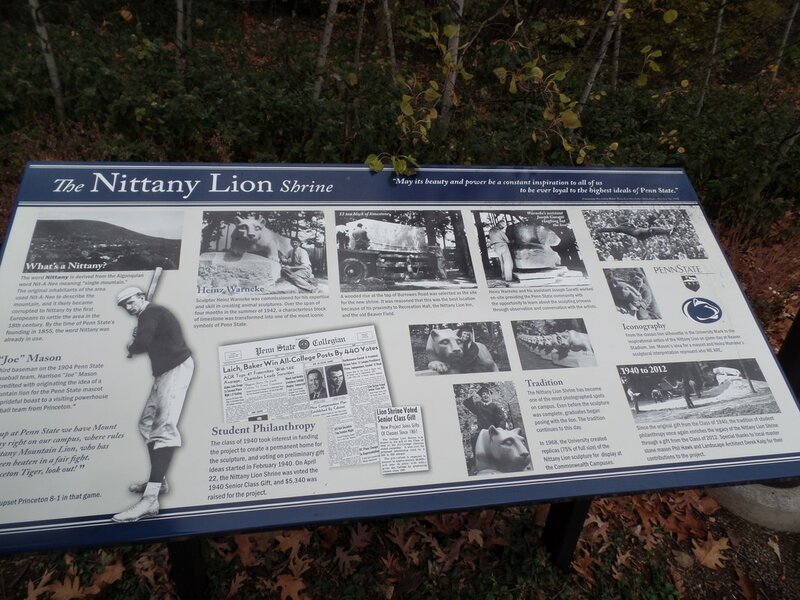 Another popular stop nearby is the Nittany Lion Inn which fills up fast if you are looking to stay there. One must see on Pollock Avenue is Old Main. Every campus needs a building like Old Main. Most of the sports facilities are centered around Bryce Jordan Center. Scoreboard: One area that doesn't need too many upgrades are the scoreboards. The North and South boards are in good shape and are a great size. The ribbon boards are solid. You would like to see something on the East or West side too though but currently there isn't any great options. Atmosphere: I have now been to two games at Penn State. The one which the review is based off was on a cold, Thanksgiving weekend day. The Nittany Lions went into the game with a chance to clinch the division and head to Indy thanks to an Ohio State win that same day. The opponent was Michigan State. Now typically this would be a big game considering how well Michigan State has played in past seasons. Well it wasn't in the cards this year for Sparty as they only won, one conference game. With all that being said yes, there were empty seats. The attendance for the game was still 97,418. That mark would be sell out almost every stadium in College Football. Penn State has a lot of traditions from Zombie Nation to We Are. Give credit where credit is due. 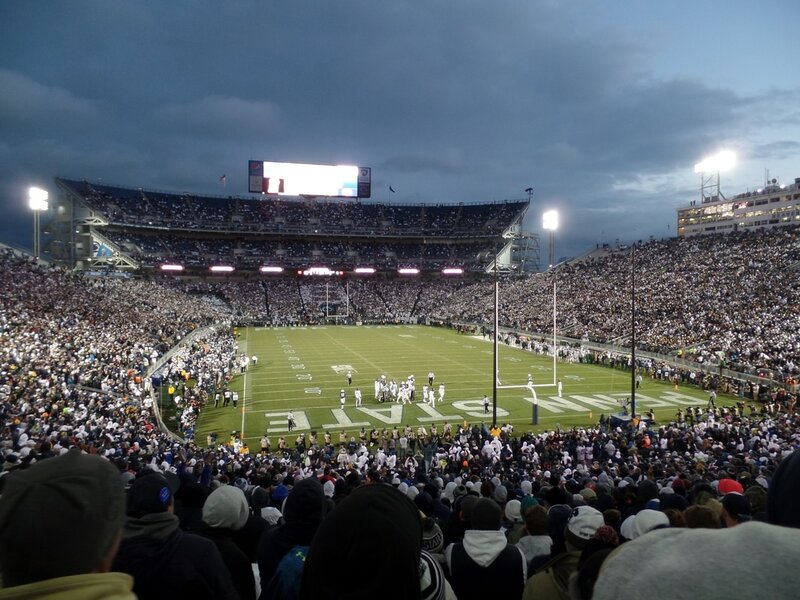 Penn State made Zombie Nation and 7 Nation Army very popular in college football. Many have copied but there is only one original. The student section was not all the way full but with students on fall break they still had a solid section. During the game there were several big cheers but one of the biggest was when everyone in the stadium found out that Ohio State had beat Michigan. Overall the Penn State crowd brings it from the massive tailgate before the game and all the way until the clock hits 00:00. 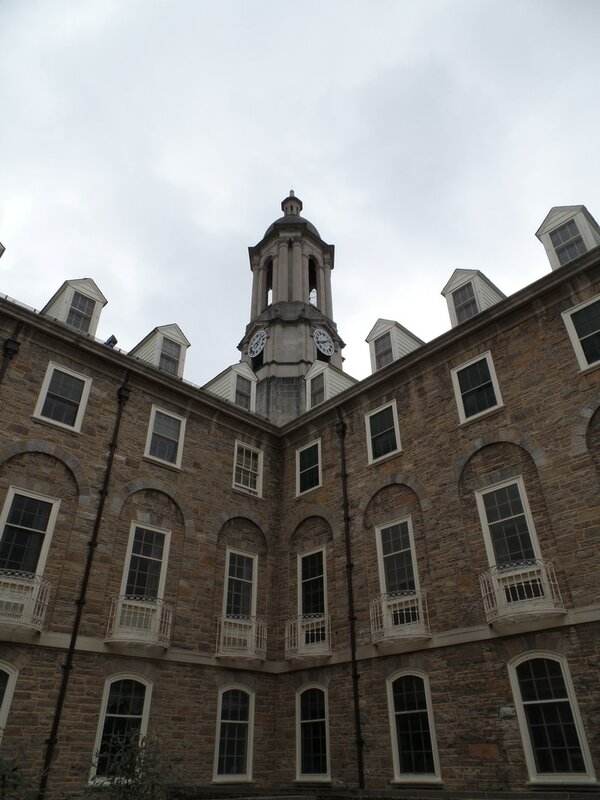 ​State College, PA: Located in the middle of the State of Pennsylvania is State College AKA Happy Valley. Here you will find a true college town. I know some folks struggle with what a college town is and if you are one of those people, visit State College. It goes without saying the Penn State University makes this city, a city. That doesn't mean that it does not have things to offer outside of a large college campus. Head to downtown State College just off the campus of Penn State. The main streets in the downtown portion of the city are Allen, Calder, Beaver, and College. Here you will find plenty of places to get Penn State gear, food and drinks. If you are looking for something to do hike Mount Nittany. This is a good college town that will keep you busy before and after the game. 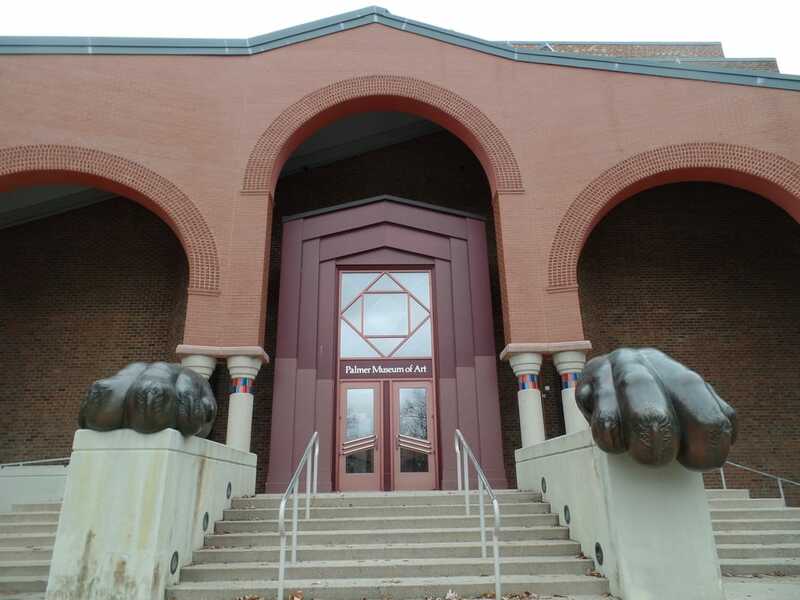 Nittany Lion Paws at Palmer Museum of Art. 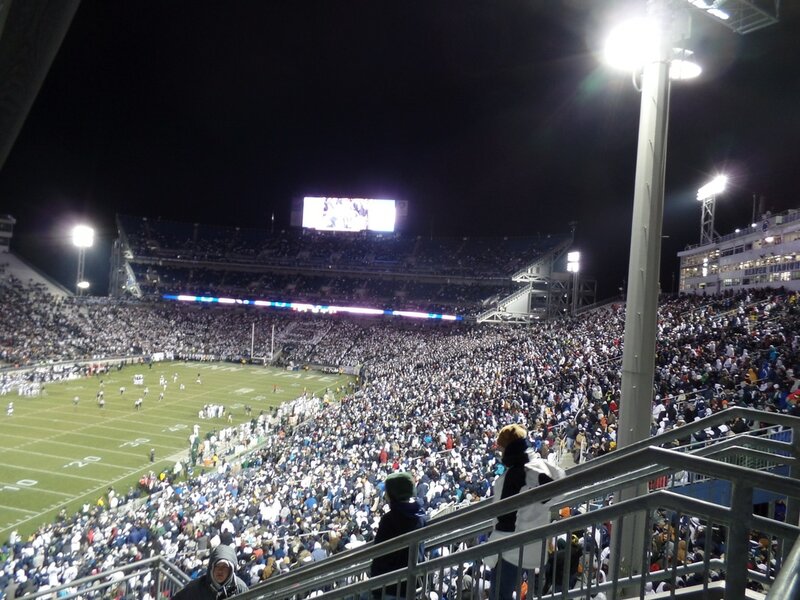 Want To Know Where Beaver Stadium Ranks?